Leaving Sarajevo, we had a few days to spare before our flight out of Belgrade, and we’d loved every bit of the Balkans we’d visited so far. So why not get in another country? 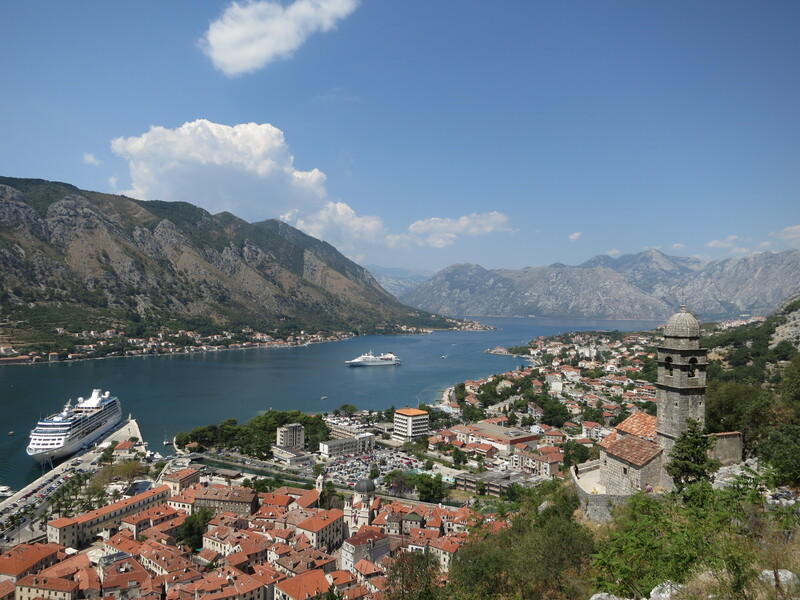 By all reports, Montenegro was a good option for some time by the water – so it was just left to pick a city, really. A combination of bus timetables (both from Sarajevo, and to Belgrade), Wikitravel pages and Google image searches helped us choose Kotor. There may have been some coin tossing involved as well – I can’t really recall. 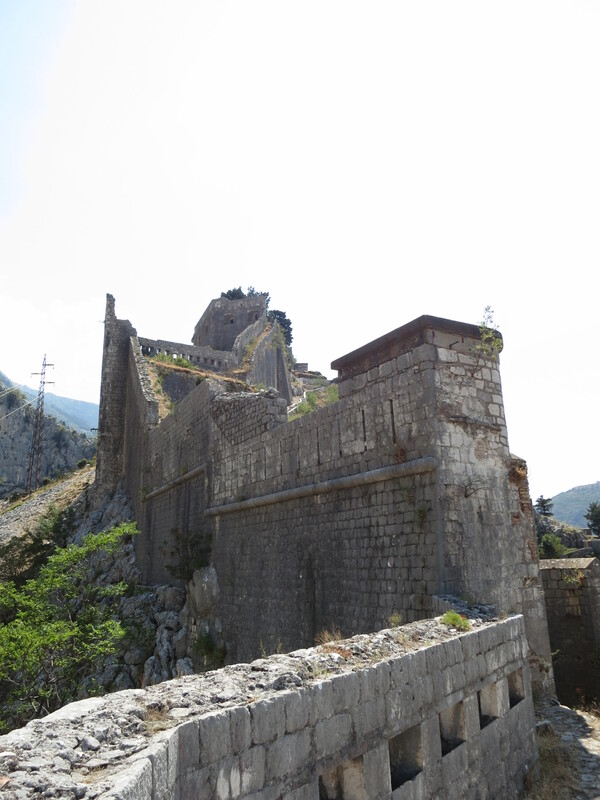 Like Dubrovnik, the fortifications are a major attraction. In Kotor’s case, this is a climb up the walls which run up the hill to St John’s fortress, for an amazing view out over the city and across the Bay of Kotor. The climb is hot and hard work, granted, but the view from the top, and the fortress itself, are most definitely worth it. 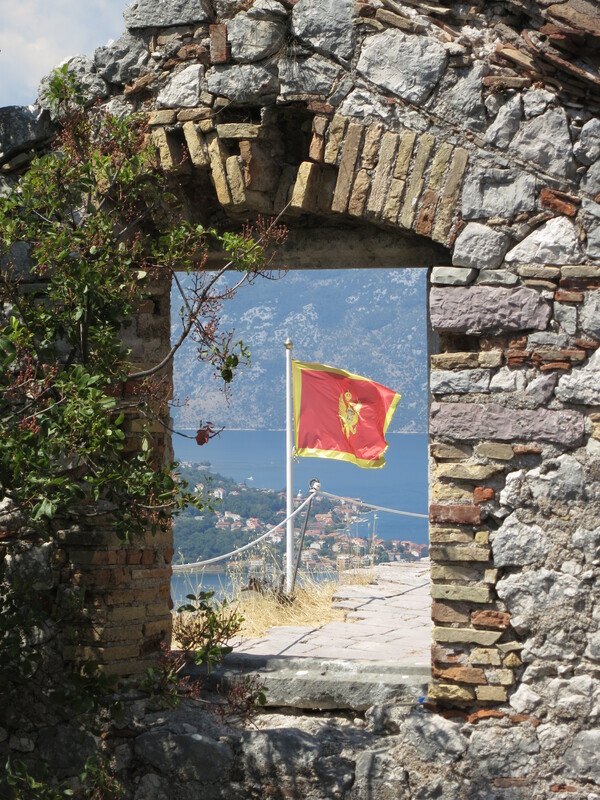 Montenegro being not yet a nanny state, you can still explore the fortress and climb on its walls, without a forest of unsightly barriers – nor a team of spoilsport babysitters – preventing you from going anywhere interesting. An afternoon well spent, enjoying the stony feel of history, marvelling at the view, and basking in the sunshine. Once you’re back down, the fortifications make for a nice view from below, too. We happily spent far too much time one evening trying for (but failing to get!) the perfect photo back up the hill as the sun set. 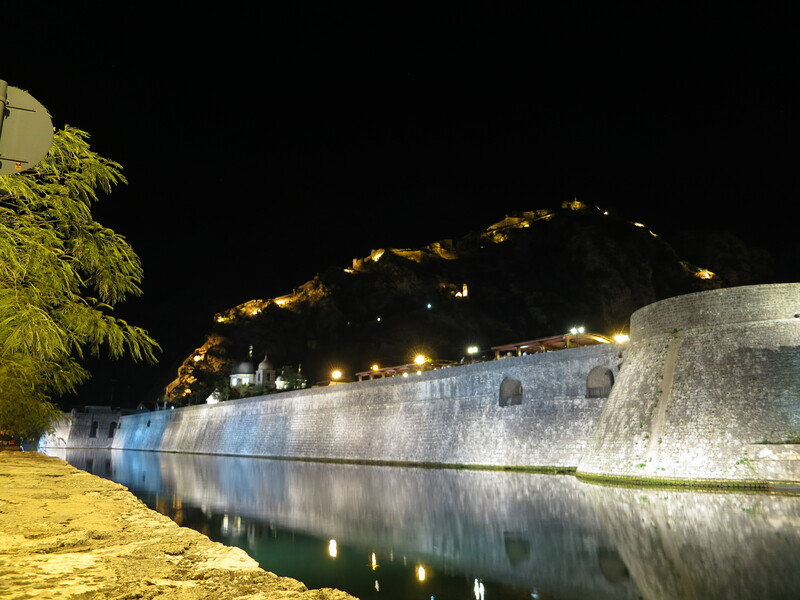 The best I could do trying to get a post-sunset shot of St John’s Fortress, above Kotor. The walls are pretty, yeah, but I feel I could have done better. Sad face. With not much time in Montenegro before we headed back up to Belgrade, but with a mid-afternoon departure, we had time for one more energetic pre-bus climb. Across the Bay from the Old Town of Kotor is a walking trail to the top of the hill on the other side. Aside from some more spectacular views, the climb also offered the attraction of a World War I era Austro-Hungarian fort: Fort Vrmac. 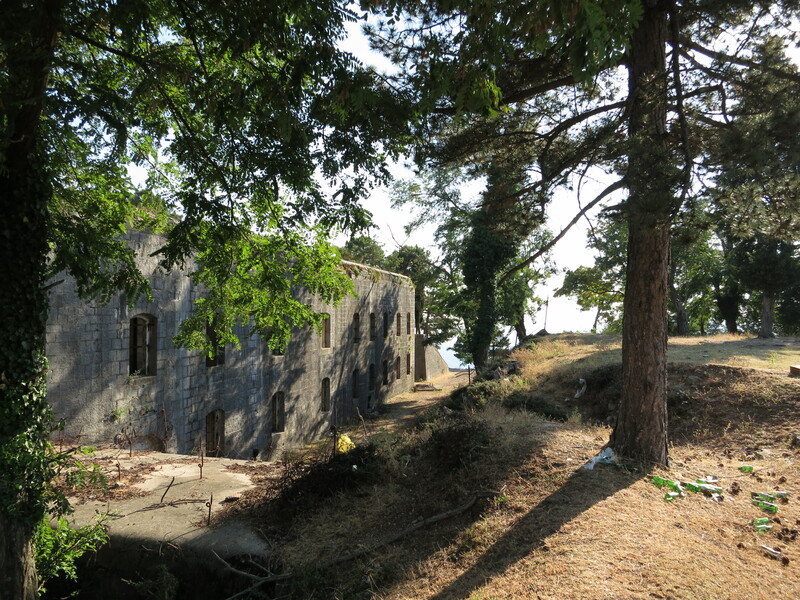 The fort is abandoned now, but not yet derelict, and perfectly accessible and open for exploration. Bring a torch, or spend a while letting your night vision adjust, and you can wander through and onto and over it all, playing quite the intrepid explorer. And then, once done, climb back down as we did, and reluctantly watch the beautiful scenery roll by on your way out of this spectacular country. As you promise yourself you’ll be back. And soon. This entry was posted in Travel and tagged montenegro by Sam Roberton. Bookmark the permalink. That top photo is brilliant. I’ve booked flights for a week in Montenegro in May, and am unsure whether to base myself in Kotor or Budva. Did you stay the night in Kotor? Yeah, we did stay the night in Kotor. We stayed in Montenegro Hostel Kotor, which we were pretty happy with. We didn’t get out to Budva, so I can’t give you much advice comparing them, I’m afraid. It’s pretty easy to bus around the Balkans, though, with pretty regular and mostly reliable bus services, so you can always move around a bit without too much trouble, depending how much time you have. I remember there were pretty much hourly buses from Herceg Novi to Kotor, for example. I was in both places in October. Go to Kotor. Do NOT go to Budva. Unless you’re going for night life and so on, in which case: Go to Spain. Do NOT go to Budva. Brilliant = thanks for the tips.